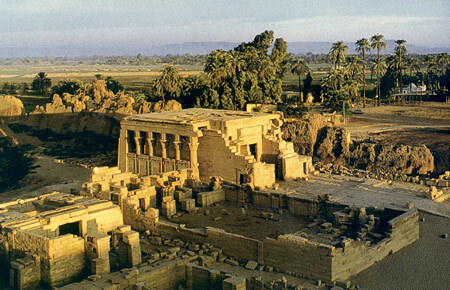 The Hathor temple is fairly young in comparison to the antique buildings along the Nile. Bedded in palm trees it is situated along the fertile board at the end of the dessert. Although the Greek and the Romans continued building the temple, it is originally from the 1st century b.c. and stayed unfinished. The big temple of the Goddess of Protection, Hathor was created instead of a far more ancient area of Egypt, under the ptolemern. The holy Hathor, was compared with Isis and is shown as a cow or a female cow with horns. The roof of the victim hall provides the best view over the whole temple area.